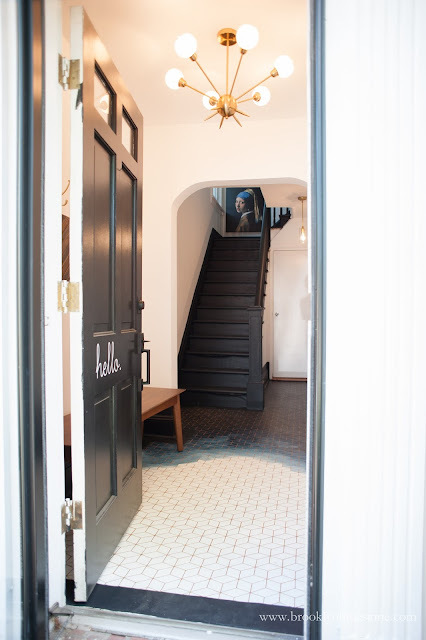 A dramatic hallway makeover is completed on a small budget including an original hand painted floor, some modern accents, and white walls. 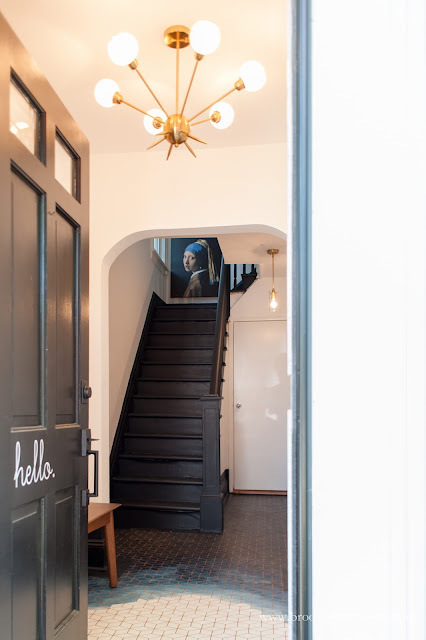 As you might expect, I love talking decor with friends so when my bestie shared she was working on her hallway, I was eager to see what she had in mind. 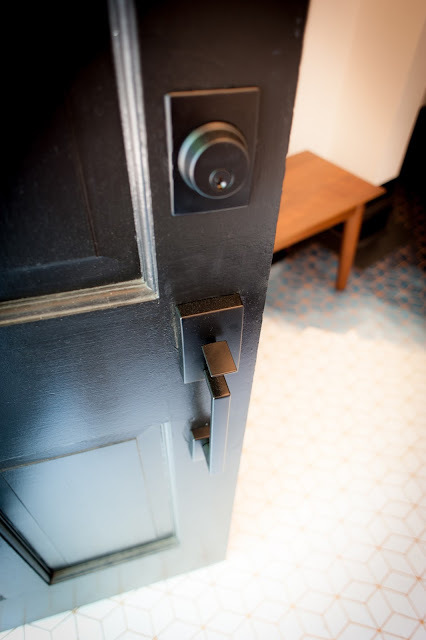 She was on a strict budget so she was going to do what she could with the space without spending a fortune. That included keeping the vinyl flooring that was ahem, less than ideal. A few weeks later I stopped by and was stopped dead in my tracks with the impressive makeover she completed. I so wish I had a before photo to share but you'll just have to take my word for it that this hardly feels like the same home. Yes, that floor is hand painted. I don't know how many hours it took but I think "a lot" would probably not cover it. She did not use a stencil but rather marked out the pattern with car detailing tape. Hard to believe this is all just old vinyl. I'm just in love with this space and wanted to share it with you too! I call it moody in the best way possible. This space tells me something about the owner while still being practical. 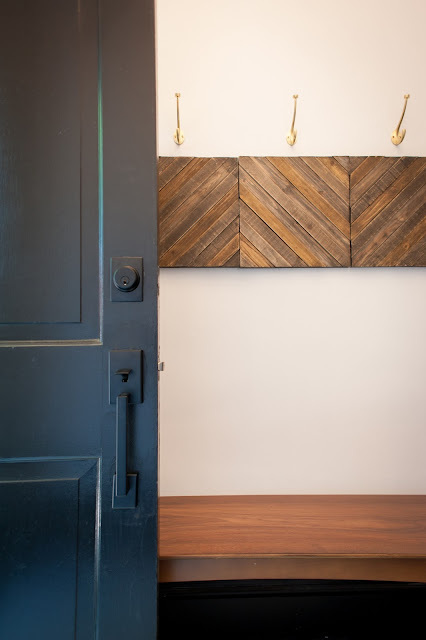 While it's small in size, the flooring and the art draws the eye in giving it a feel of more space. Hooks and a bench make it functional. 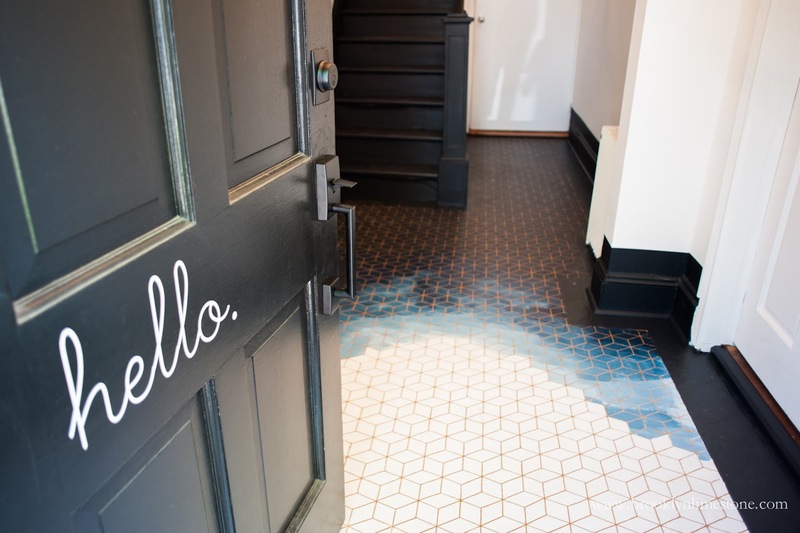 The "hello" and "goodbye" give it whimsy and finally, the floor gives so much style. 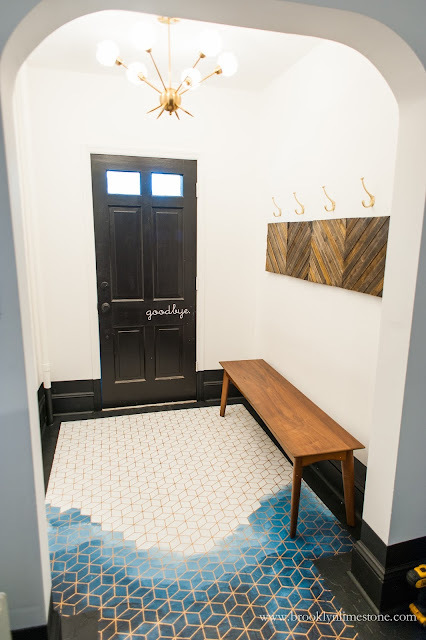 What design would you use for a hand painted floor in your home? 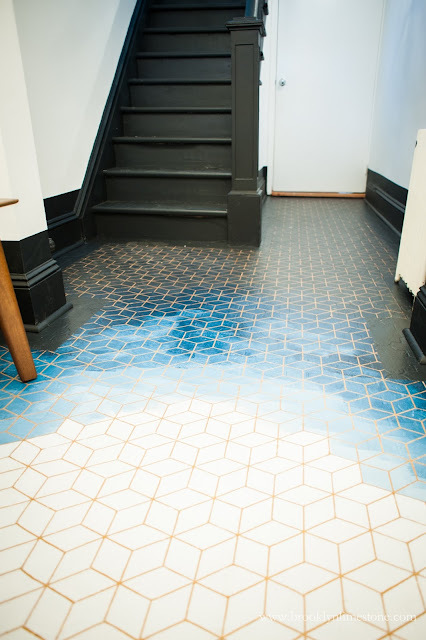 The floor is several colors - an ombré effect of dark blue getting gradually lighter until its white. All that lies under a gold geometric pattern on top. The border around the room is black. Definitely original - like a modern work of art underfoot. Gorgeous. Any chance for a DIY steps to this great floor. I wish I had photographed it in steps so I could show a more detailed DIY but I do know that she painted the black border first, then a layer of gold, then used car pintstriping tape (http://amzn.to/2ui4Y2K) to create the pattern on the floor. Lastly she used the dark blue and white paint to create the ombre effect over it. When the tape is removed, the gold pattern is really crisp against the background. Hope that helps! This is so helpful! I have a vinyl floor in our bathroom that I don't have the budget to remove, but would love to redo. Do you know if she had to do anything special to prep the floor? Or seal it after it was painted? Thanks for all the great ideas and please tell your friend how beautiful her floor is! So interesting and ingenious! Just love it, but can't imagine the painstaking labor it took to get there. What a beautiful and time-consuming transformation! The whole entryway beautiful, artful mix of patterns and texture. Well done! Stunning!!!! A true work of art! I can't imagine the patience it took to do all the painstaking detailing, but the artistry is beautiful. I would love walking into a home like that because I would automatically know I was going to love the stylish person who lived there! These tiles are breathtaking! Wonderful job. Also I find it very fresh & original to put a "hello" sticker on the door. I seriously can't even figure out how she did this -- even with your description, haha! It is AMAZING and I am in awe of this DIY!! Heart Eyes for days....like seriously my mouth is hanging open. 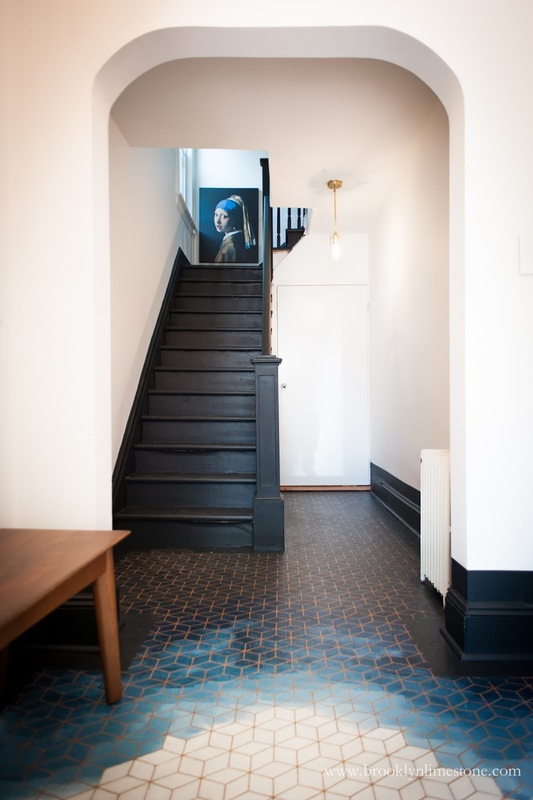 THAT FLOOR and then the stairway is just...oh my gosh this whole space. 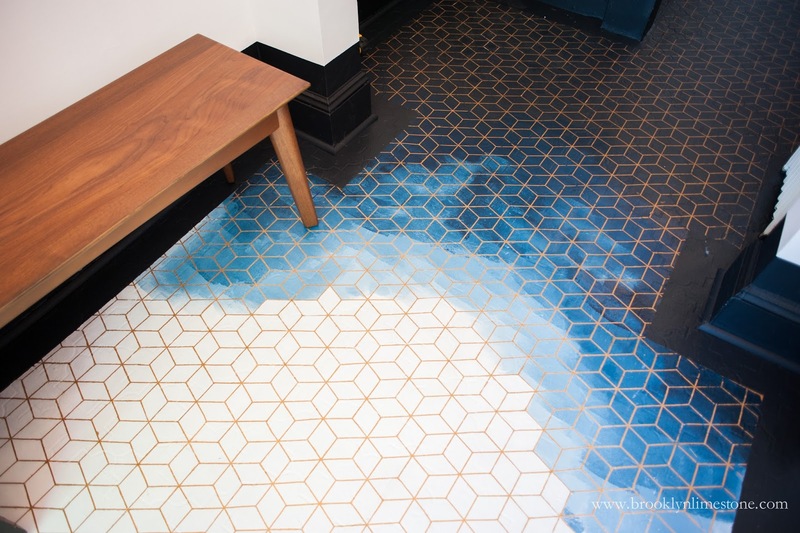 I want to do this floor! <3 I also love that she seriously painted it all, so tedious but so much cheaper than doing something with tile like that! I can't stop thinking about this floor. Can someone post a tutorial and a stencil!?! I have a screened porch I'd love to do this on. oh my gosh!!! i am so jealous of your friend's talent (and patience). this floor is just incredible. the whole space is beautiful.